Brothers and Sisters in Christ, hear the Word of the Lord: the time is assuredly coming when the Lord will deliver you out of your storm, trouble, distress, or trial. Are you in a great storm? 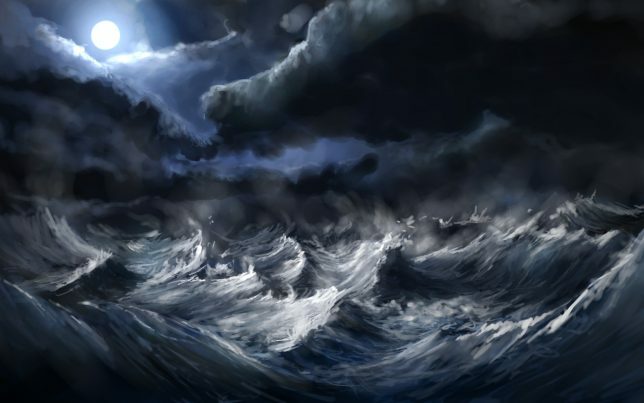 Do you feel like you are covered by the waves of your storm and about to go under? Brother or Sister in Christ, keep praying…keep calling out to the Lord…be encouraged…let your faith be renewed…and KNOW that there WILL come a point in time when Jesus ARISES and He rebukes YOUR storm. Your storm will not last forever…although it may seem like it. You will not be in this storm for the rest of your life…although it may feel like it. There is coming a time when the Lord will deliver you! In Matthew 9, the Disciples were just following Jesus…and that landed them right in the middle of a fearsome storm. Well, just as it was with the Disciples, following the Lord will sometimes land you and I right in the middle of a fearsome storm. But, we can count on the Lord’s faithfulness. We can count on the Lord to give us a great testimony. We can count on the Lord to glorify His name. Similarly, in Psalms 107, the Bible does not say that God will spare us from ever experiencing distresses. Rather, the Bible asserts to us that God will bring us out of our distresses…and He will bring us to our desired outcomes. Again, there will be times when you have to go through troubles. There will be times when the wicked are coming against you. There will be situations that you need the Lord to deliver you out of. The Lord WILL be with you…the Lord WILL help and carry you THROUGH your storms, distresses, and troubles…and the Lord WILL deliver you…along with honoring you…so that you can glorify the Lord…and so that you can show and tell others of the Lord’s goodness and greatness! The time is coming when the Lord WILL deliver you! So, hold steady…stay faithful…believe and trust in the Lord…He is faithful TO YOU.